"There really is no residential development along 1st Avenue whatsoever," says one resident who supports the original choice of 3rd Avenue. 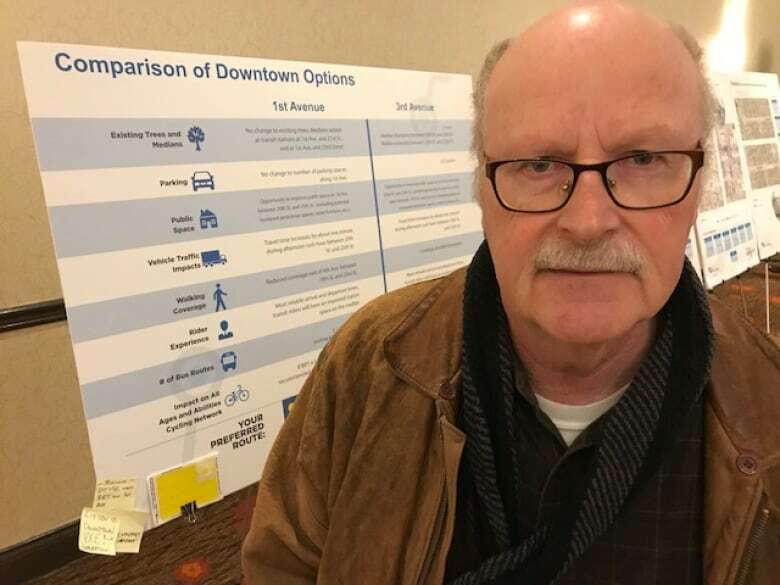 Several Saskatoon residents voiced their support this week for a dedicated downtown bus-rapid-transit (BRT) lane running on 1st Avenue. Robert Clipperton wasn't one of them, though. He prefers the city's original recommendation, 3rd Avenue. 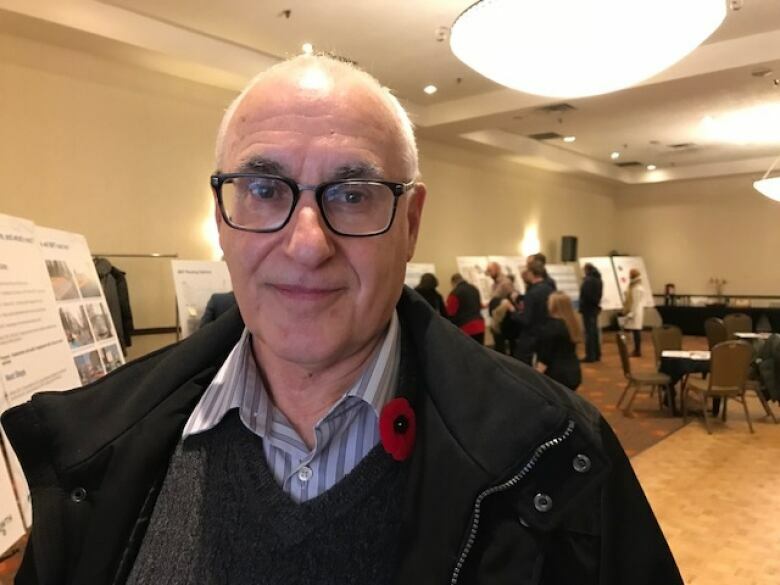 "There really is no residential development along 1st Avenue whatsoever," said the Nutana resident at an info session hosted Tuesday by the City of Saskatoon. "You need to go on the other side of Idylwyld before you find anybody living along there. "Whereupon if you look at 3rd Avenue, to the east of 3rd, there are quite a few large high rise apartment buildings," Clipperton said. "Many of the residents there are elderly people and they're not going to want to walk all the way 1st Avenue to take the bus." "That's a valid concern," said fellow attendee Jacquie Nadon, who nevertheless identified as a member of Team 1st Avenue. "Just for simplicity's sake," she said. "Just if you want to connect it to the Sid Buckwold Bridge. And then I kind of like the idea of the 3rd Avenue [bike lane] connecting to the new Traffic Bridge." 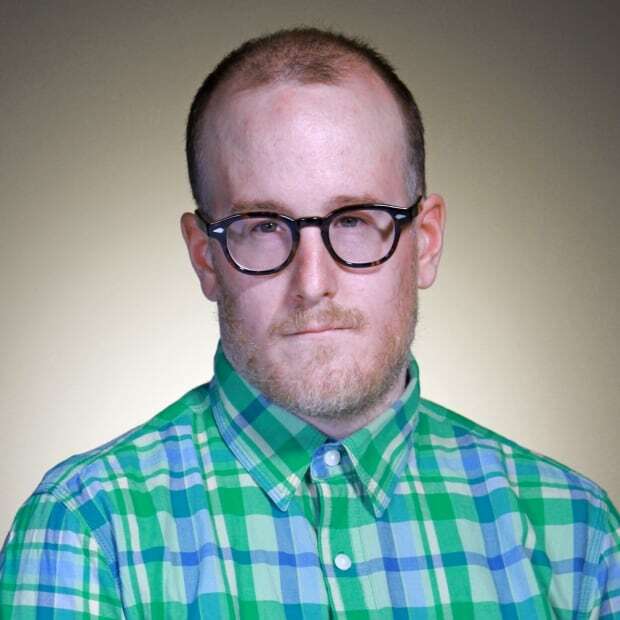 Nadon's friend, downtown resident Brett Smith, voted for 1st Avenue too, but for different reasons. "It just seems to have less traffic," he said. "There's a lot more available space for things like parks, or community activities and things like that." Real estate consultant Glen Paziuk says 1st Avenue too. He points to potential future development at the nearby city yards as well as the planned $80 million renovations at the Midtown Plaza, which is located on 1st Avenue. While he acknowledged Clipperton's concern about the lack of residents living on 1st Avenue, he expressed faith that that won't remain the case. "That's an objective of the city: to increase density in the core area," he said. The City of Saskatoon had originally recommended 3rd Avenue as the site of the downtown BRT lane. But it went back to the drawing board this past summer, one week after the owners of the Midtown Plaza unveiled their renovation plans. One of those owners, as well as the downtown business improvement district, went on to express their preference for 1st Avenue. City councillors are expected to make final decisions on BRT routing in early 2019.